Bhubaneshwar: The admission session has begun in two top colleges in the state of Odisha. 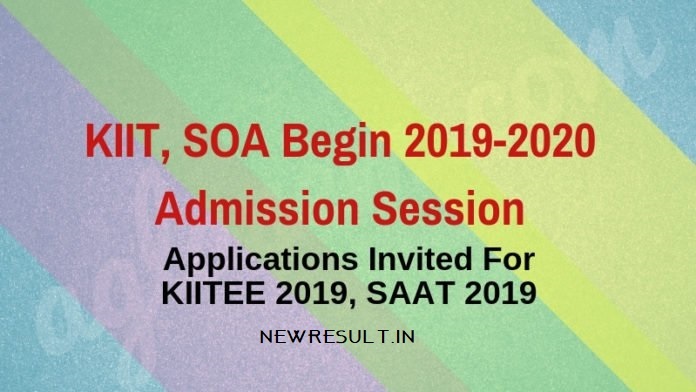 Kalinga Institute Of Industrial Technology (KIIT) and Siksha ‘O’ Anusandhan (SOA) has started the admission process via their respective admission test known as KIITEE 2019 and SAAT 2019 respectively. KIIT will be conducting KIITEE 2019 from April 15 to 24, 2019. The application forms to apply for the exam is now available online on the official website of KIIT. KIITEE 2019 Application Form will be available until March 31, 2019. The exam will be held in the online mode only across the nation. Siksha ‘O’ Anusandhan will be also conducting their entrance exam for admission. Their entrance exam is known as SAAT. The registration to apply for SAAT 2019 is now available online at the official website of SOA. The SAAT 2019 exam will be conducted in the online as well as in the offline mode. The online mode of the exam will be held from April 13 to 30, 2019. The offline mode of the exam will be held on April 21, 2019, only in the state of Odisha. To apply for KIITEE 2019 or SAAT 2019, candidates will need not to pay any application fee. The application forms are to be submitted before the last date to be eligible to appear in the entrance examination. Candidates who will have appeared or will be appearing in class 12 board exam in 2019, are eligible to apply for both KIITEE and SAAT for UG engineering admission. The admission process of both KIIT and SOA is similar. Candidates first have to fill in the online application form, book their preferred exam slot, download the admit card for the entrance examination, appear and qualify the entrance exam. At the last leg, the candidates have to appear in the counselling rounds to finalise their admission. KIITEE 2019 is being held across 69 exam centres across the nation. However, SAAT 2019 is being held across 31 exam centres in online mode and in 22 exam centres across the Odisha state in the offline mode. Now, talking about the Universities, KIIT and SOA both are one of the most sought-after engineering colleges in the state of Odisha. Both the colleges are located in the city of Bhubaneshwar. The KIIT University has been ranked 8th among reputed private universities in India, and no. 42 in the NIRF 2018 rankings. SOA has been ranked at no. 24 in the NIRF ranking 2018. The campus of SOA is divided into 5 campuses on the basis of the courses and departments. These campuses are Engineering Campus, Health Sciences Campus, SUM Hospital Campus, Agriculture Campus and Management and Law. The KIIT fee is Rs. 1,50,000 per annum for 4 years B.Tech course and for SOA it is Rs. 2,29,000/- Per Annum for B.Tech courses. The placements offered by these institutes are top notch too. Every year companies like Amazon, IBM, Infosys, Accenture, Microsoft, Siemens, EY, Microsoft, Cognizant, Genpact etc visit for campus placements here. For more updates on engineering admissions 2019, keep a watch on Newresult News!